Astute readers may have deduced from the title of this post that my first attempt at making marshmallows using agar instead of gelatine was less than successful. And they would be right. Boy, would they be right. About the only good thing I can say for this tray of attempted marshmallow is that it matches my handbag. My flamingo handbag. Exhibit A: The alleged marshmallow. Not a pretty sight. 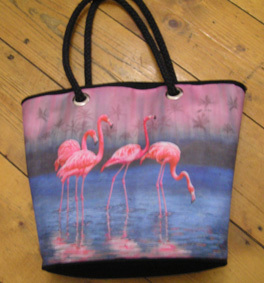 Exhibit B: The flamingo handbag. Much prettier than marshmallow. Yes, I know. Way too much food colouring. My hand slipped, you see. Twice. Because I regret to inform you that the pink stuff tastes very nearly as scary as it looks. Rosewater is not an ingredient that improves when used in large quantities. Anyway, a good scientist records her failures as well as her successes, which is in fact why I stopped studying chemistry at the end of Year 10 (I’m just a tad competitive). Nevertheless, I shall boldly attempt to write this experiment up in a suitable fashion. For science! To make a marshmallow without using gelatine. Marshmallow apparently got its name originally from the marsh mallow plant, which was used to thicken the sweet. Not having a source of marsh mallow available, I decided to go with agar instead. Pectin won’t set without sufficient acidity in the mix, but agar is happy with alkaline or neutral mixtures (don’t put anything acidic in your agar if you want it to set, however). I didn’t have a recipe for vegan marshmallows, so I consulted the internet oracles, and the consensus seemed to be that 1 1/2 tsp of agar would set about 600g of sugar syrup. My basic recipe uses just gelatine and sugar syrup, though the proportions are quite different, but I know agar is much stronger and also produces a tighter gel than gelatine, so this seemed plausible. Accordingly, I soaked the agar in cold water while I boiled sugar, glucose and water to soft ball stage (look, I’m not going to bother with exact amounts here, since you don’t need a recipe for disastrously failed marshmallow any more than I do), and added it to the agar in a slow stream, while beating the mix with electric beaters. 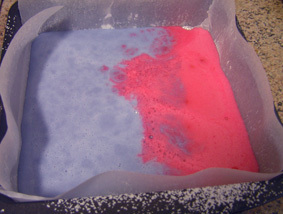 I then continued to beat the mixture until it was completely cooled, added disastrous amounts of food colouring and flavouring, poured the lot into a tin lined with paper and a layer of sifted cornflour and icing sugar (50/50) and left it to set. You’ve seen them. Not pretty. Basically, I’m pretty sure there wasn’t enough agar. The marshmallow started off in the usual unpromising fashion, as a slightly thick, slightly opaque, wholly unappetising, beige liquid, which eventually started to thicken and turn pale and peaky. It took a lot longer to thicken than gelatine marshmallow, and never really seemed to get aerated in the same way – I beat it for about 20 minutes, and while it did change in consistency and became almost white and difficult to get the beaters through, it never reached ‘stiff peaks’ and didn’t really increase much in volume (gelatine marshmallow ends up looking a lot like uncooked meringue). Moreover, it has been sitting uncovered in its tin for nearly 6 hours now and appears to be just as liquid and gooey as it was when I poured it in there. The online oracles suggested overnight setting, which can mean anything from 6-12 hours, but I’ll be quite surprised if this sets even if I leave it until tomorrow morning. It doesn’t look like it’s changing at all. Also, I used far too much rosewater and lavender water, and it tastes like soap. I only wish I could blame the agar for that, but I can’t. The disturbing flavour and colour of this marshmallow is merely the evil cherry on top of the entire ice-cream sundae of wrong that is my marshmallow mix. I’m pretty sure I need to at least double the agar next time, or possibly just buy new agar – further inspection revealed that my agar was past its best-before date, though it worked just fine in the agar jellies I made last week. It’s also possible that my agar was of a different grade to that found in the US, where the vegan marshmallow recipes originated. No idea how I can check that, however. I think I also need to check my scales, as they were behaving a little oddly and I’m not absolutely certain how much syrup I ended up making. On the other hand, the grapefruit pectin jellies I made immediately after the marshmallow worked out perfect well, so I suspect the scales are not the sole culprit here. I believe experiment 2 will involve 3 tsp of freshly purchased agar and the same amount of syrup, assuming my scales behave correctly. And *much* less food colouring. For the agar, can I suggest the Radical Grocery, near Jewell Station? For the glucose, do you need glucose syrup inna jar? Can I give you some? I have TWO jars because I bought some in case I didn’t have any (I did), and then didn’t wind up using any in the recipe anyway. I NEVER use this stuff. And I’m going to move in a couple of months, so you’d be doing me a favour, honestly! Frankly, you could have *both* jars if you wanted. Yes, it’s glucose syrup I’m after – if you aren’t using them, I’d be delighted to take them off your hands. I can give you some pectin jellies in return, if you like (they are, of course, vegan). I’ll have to check out the Radical Grocery Store again – I haven’t been there since they moved, and wasn’t sure where they were. It will still have to wait until after payday, alas! Where are you moving to, incidentally?